If you’re the type who enjoys barbecue-related content on the web, or if you’ve ever looked at brochures and other advertisements for grills and smokers, you may have noticed a common thread? The equipment is almost always photographed or filmed on some expansive patio, or in a backyard that stretches to the horizon. Do these people live on ranches in Montana, or the Outback, or something? What about folks with more modestly sized outdoor spaces? Barbecuing in a small yard, or on a diminutive patio or balcony can be a challenge. Still, there are ways for townhome, condo, and apartment dwellers to enjoy the taste of fresh barbecue in their own spaces. Since we firmly believe in the universal and inalienable right to grill, we’re going to help you find your cooker today. This article will help you determine what to look for in the best small grill for a small-space grilling solution. We’ll cover features you want, and some you don’t. Also, we’ll touch on rules and regulations for barbecuing in small spaces, shared spaces, urban environments, and other highly restrictive environments. Ultimately, we will narrow down the field of contenders to a few grills that we think are among the best on the market for you to choose from. For each model, we’ll identify the pros and cons, and make recommendations for the best units for particular situations. The end goal is to get you grilling as soon as possible in your small(er) space. 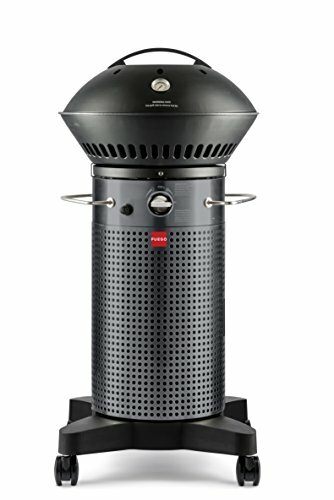 To Grill, or Not to Grill: Am I Allowed to Have a BBQ In My Small Space? Before we get too far into the article, we need to stop and look at the legal reality of the situation. It’s possible there may be bylaws or regulations in your area that you need to consider before you get a grill. Some municipalities have strict regulations about where you may use a barbecue. For example, many localities prohibit the use of barbecues on wooden decks. Others require you to maintain a safe distance from the nearest structure. Even if there are no government mandates regarding grills, it may be if you rent a unit or own a condo, the landlord or condo owner might have his/her/its own set of regulations. In London, U.K., the London Fire Brigade strongly recommends against barbecuing on any balcony, but there’s no law saying you can’t do it. In New York City, it is prohibited to store a 20-pound LPG tank on a balcony or roof of a multi-family dwelling, but you can use a smaller tank for a short period. Charcoal BBQs are wholly forbidden on balconies and rooftops, and in a backyard or on a terrace, there must be 10 feet of clearance between the grill and any walls, plus ready access to a water supply or fire extinguisher. Electric grills are good to go anywhere in NYC. To be sure it’s ok for you to own a grill, and what kind, consult the website for your municipality or give them a call. If you’re renting, or you live in a condo or townhome, speak with your landlord, the property owner, or get in touch with your condo association to find out what’s allowed. Safety is the number one issue with grilling in a small space, so take the rules and regulations seriously. Many entirely avoidable fires are caused each year by people barbecuing where they ought not to. Let’s start by going over some of the features and factors to consider before you make the plunge and drop the coin. Remember the old carpenter’s motto, “measure twice, cut once”? The same applies here; do your homework and buy the right grill the first time. Of course, you never want to buy anything you know is a piece of junk, unless you’re entering into a demolition derby. How often will you be grilling? What kind of weather/environmental conditions will the grill be exposed to? If you know your grill is going to get heavy usage, you want parts made of solid, durable materials that are well put-together. If it were going to be outside and uncovered most of the time, give some thought to rust resistance. Unlike grillers with conventional spaces, if you have a small yard or balcony to work with, you may not get to choose your fuel type based on personal preference. It may be necessary to choose what is allowed by your municipality or property owner. Make sure to check this. Charcoal is, understandably, forbidden in most apartment and condo buildings, or anywhere with a lot of wood. Unextinguished coals are an apparent fire hazard. 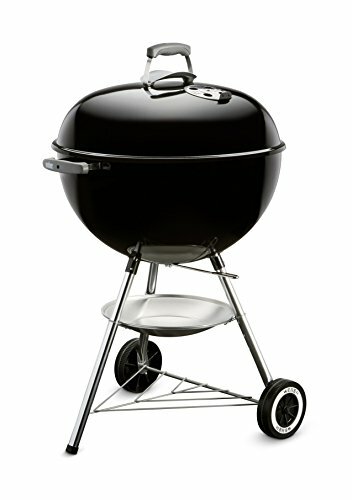 Although most purists prefer a charcoal grill, make sure you do your research before you settle on this kind of grill. Propane, or Liquid Propane Gas (LPG) allows you to have an open flame, but without the issue of needing to extinguish a solid fuel. LPG tanks and grills are available in many sizes and can be very convenient – certainly they’re a leading choice for campers and tailgaters. Tanks must be stored when not in use, and some regions have strict rules about LPG storage. A rare choice for small spaces, but certainly convenient when available. You won’t see this on a balcony anywhere, but where allowed, it could be set up in the small backyard of, say, a townhome. Be sure to hire a gas fitter who has all the necessary certifications to work in your area, and be sure to check out our guide to the best natural gas grills available today. You might think of this as a last resort, but it’s a viable alternative when no conventional options are allowed, or practical. Although it’s not the same as cooking over a fire, at least it’s still cooking outside – you can even make grill marks! Before rushing out to buy an electric grill for your balcony, though, ensure you have a suitably located outlet. You don’t want the cord to be a tripping hazard – an electric grill can leave a burn mark on your skin just as readily as a gas or charcoal BBQ! Take a look at your space and think about where you’re going to be able to set down your utensils, spices and sauces, and the food itself before it goes on the grill. If there’s nothing handy, and no place to put a table or shelf, think about whether you might need a grill that has some shelves or hooks. If you have somewhere in mind to place your new barbecue (make sure it’s solid, steady, and not flammable), then you won’t need to worry about a stand. However, if you do need a self-supporting grill, look for one that’s sturdy and not prone to tipping. If you think you’ll be moving it around much, wheels are a must – even a light grill starts to seem heavy after shifting it about a few times. Size is perhaps the most critical factor to consider. Trying to shoehorn an oversized grill into a tiny space is impractical and possibly dangerous. Measure your space and think about how people will move around the grill. You don’t want to risk rubbing up against a hot grill while trying to get to your chair. You might try cutting out a piece of cardboard as a template to determine how large a footprint is practical/safe to work with. Small grills and accessories don’t always go hand-in-hand. But, just because you’re going with a more modest grill, that doesn’t mean you necessarily have to go without any perks. Give some thought as to how you will use your grill and what you’ll be cooking. For example, if you’re just flipping a few patties or rolling some sausages, you won’t need a battery of hooks for hanging all your utensils. Try to find one with the features you actually need, but be prepared to compromise to get a grill that fits in your space. There’s no substitute for experience, so it’s worth looking at what others have to say about a grill before you make your choice. All of the grills we’ve selected have been favorably reviewed overall, but nothing is ever perfect. It’s good to read through comments and see what situations have given positive results, and what circumstances may have led to a negative review. Reviewers Tip: Don’t make a judgment based on star ratings alone! Often, people will leave a bad review just because there were shipping issues, and these are seldom a reflection of the quality of the barbecue itself. Consider carefully before deciding how much to spend on a barbecue. Think about how often you plan on using it, and what you’re going to cook on it. If you plan on making a few burgers a couple of times per season, there’s no need to break the bank on a luxury barbecue. But, if you really want to get grilling some gourmet stuff on a regular basis, you might wish to loosen the purse strings just a bit. I’ve grouped the grills we’ve selected by fuel type, to make life easier for those of you who already know what you’ll be using. There are also links for you to check them out in greater detail, or even jump right in and make a purchase. If you’re not familiar with the kamado style of grill, I suggest popping over and reading our feature on the best kamado grills. If you are familiar with them but know you haven’t got room for one of the monsters, you could consider one of the smaller options available. One of the leaders in the kamado segment is Kamado Joe. 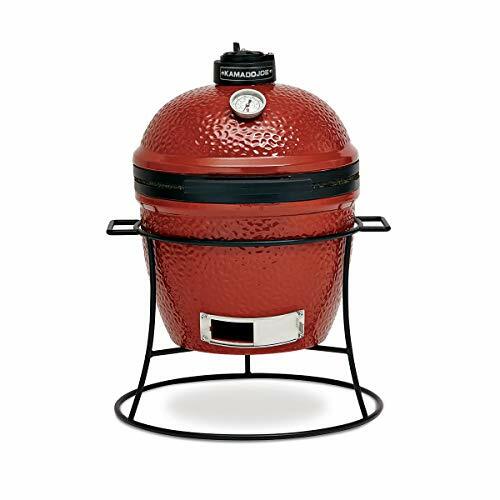 There are three different sizes of Kamado Joe: The junior, the classic and the Big Joe. The Joe Junior is compact enough to fit on a patio or balcony, but can still cook a dinner for a couple or small family. Grill space is limited to 148.5 square inches (it’s 13.5” in diameter), but that’s still enough to cook four burgers, or 2 steaks at once. You can even slow cook – because that’s what a kamado grill is best at – a 12-pound turkey, or any chicken you can get your hands on. While you might be tempted to step up to a medium sized classic, think carefully about your space, and about moving it around. While the extra 108 square inches of cooking surface would be great, it’s also 188 pounds – that’s 120 pounds heavier than the Junior. Having a Kamado Joe Junior at your disposal really opens up your barbecue options. Not only can you quickly cook up direct heat staples like the aforementioned burgers and steaks, but you can also go low ‘n’ slow smoke a rack of ribs or maybe a small brisket. And how many balcony-size grills can do a whole chicken or turkey at once? For such a small cooker, a Joe Junior can set you back a fair penny – over $500 MSRP, but with a built-in thermometer, 304 stainless steel cooking grates, ceramic heat deflector, grill gripper and ash tools. It’s also exceptionally well made and will provide a lifetime of enjoyment. Just be sure it suits your needs; if you’re not into low ‘n’ slow, this maybe isn’t the grill for you. I have to tell you, the Weber website isn’t the easiest to navigate. You’re welcome for us doing the research for you. Sometimes, there’s nothing quite like getting back to the roots of a thing. For barbecuing, that means glowing embers of wood. Well, since you can’t build a fire pit on a deck or terrace, charcoal is your best option. For many, the charcoal barbecue is the epitome of the backyard cookout. The Weber Original Kettle is a classic charcoal grill, the kind many of us remember from our childhoods, and which plenty of grillers still love today. The design has changed little over the years, and with good reason – you don’t fix it if it ain’t broke! It still appears high in my list of modern time, great charcoal grills! Weber makes all kinds of charcoal grills, but the Original Kettle is simple, effective, and compact. It’s everything you’re looking for in a small-space grill. This model is a 22” unit with 363 square inches of cooking surface. That’s pretty hefty for a ‘cue that takes up fairly little space! If you need a smaller kettle, there’s an 18” version, but we think sticking to the 22” maximizes versatility. There are plenty of features to love on this grill, including the ash catcher in the stand and the easy-to-open bottom chute. 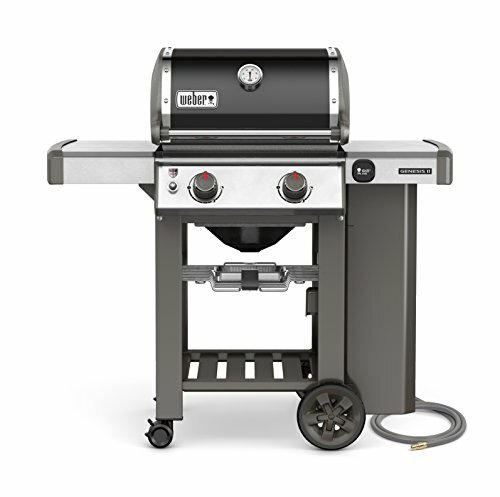 The triangular stand should offer good stability – that’s something Weber prides itself on – and you can hang the lid on a side handle when you don’t need it. There’s even a heat shield below the lid handle to keep your hand safe. All exterior parts are rust-resistant, but I always suggest buying a cover if you’re going to store it in an exposed location. Of course, there are some things to not like about this grill. For instance, there’s no thermometer. I know this is a lower-cost unit, but would it detract that much from the profit margin to add a simple gauge like that? There’s no workspace, either, save for a small shelf down at the bottom of the stand, though I think that’s more for structural rigidity than for stashing your accessories. All in all, this is an excellent option for those who want a basic charcoal grilling experience, and don’t want to drop a lot of coin on a ‘cue. As I type this, Weber’s ridiculously media-heavy website is causing my computer to lag so badly, I can’t see what I’m typing. Fortunately, they know a lot more about making a user-friendly barbecue than they do websites. The Genesis II E-210 is the smallest model of the Genesis line, but it has a lot in common with the larger grills. Great features you get in a reasonably compact package include porcelain-enameled cast iron grates, side tables with hooks, a warming rack, and even a fuel gauge. Just like a full-size barbecue, the lid is hinged. This is a plus, but it also means you need enough clearance from the nearest barrier to open it up. The main body of the unit is cast aluminum, and the handle, control panel, and work areas are stainless steel, so rust should not be an issue. The stand sits on four wheels -two casters and two large wheels- so moving the unit around should be a breeze. The left-side work table folds down, freeing up valuable space when in storage. Under the hood, there’s 380 square inches of primary cooking surface, plus a 114 square inch warming rack that tucks out of the way when not in use. The twin stainless steel burners put out 26,000 BTUs, and above them are the ‘Flavorizer Bars,’ wedges of metal that turn drippings into smoky flavor. If you dig tech gadgets, you’ll be glad to know the E-210 is, “iGrill 3-ready.” What’s that? It’s a digital thermometer you can attach to the ‘cue (sold separately) that sends data to a proprietary app you install on your smartphone. Necessary? No. Very cool? Hell, yes! So, it’s a well-built, high-quality portable gas grill, but will it fit in a small space? It stands 45” tall; it’s 47” wide, and 29” deep (add 2” with the lid open). Total weight is 116 pounds. Well, it’s not likely to fit on your balcony, but it would be suitable for small yards and terraces. This is an excellent grill for just about any barbecuer, but particularly for someone with spatial restrictions. What you don’t want are budgetary restrictions, however, because it’s not inexpensive. Still, you should expect this grill to last for a very long time and provide a quality grilling experience throughout. Sometimes, the only requirement we have of a product is that it be good enough to do the job. We don’t need bells and whistles, fancy features, or even superior workmanship. If that’s how you feel about barbecuing, the Classic 280 might be the right choice. No doubt about it, this is a stripped-down, basic, low-cost gas grill. It has two burners (20,000 BTU total), which means you can set up separate temperature zones and expand your grilling options. Push-button ignition makes firing up the grill easy, and I love the over-sized lid handle that keeps your fingers away from the heat. The lid and firebox are porcelain-coated steel, and the burners are stainless steel. Above the burners you’ll find porcelain-coated wire grates, providing a total cooking space of 280 square inches. That’s plenty for a small family or group; expect to be able to cook a dozen small burgers at once, or several steaks. There’s even a shelf on either side of the cooking area for you to prep food and rest your spices and utensils. As an option, you can order this barbecue with a side-burner in place of the left shelf. What you don’t get is a thermometer, which is an unfortunate omission. There’s also no warming rack. The stand, which does have wheels, seems rather flimsy, and I can readily imagine it flexing and twisting as you roll. Still, the whole thing weighs less than 43 pounds, so perhaps it’s all that’s required. As I indicated at the beginning, this is a no-frills grill and isn’t meant for a serious griller. The lack of lid depth and absence of a thermometer will keep you from doing anything but fairly basic grilling. If that’s ok with you –maybe you just want to do dogs and chops and wings and stuff- then this may not be a bad investment. It’s a budget-friendly barbecue on an open flame from a brand name you know. If your space is truly compact, but you’re not willing to forego either real flames or a grill large enough to cook for a family of four, the Fuego Element F21C may be the grill for you. If you value having a really cool looking grill, this is definitely the grill for you! I’m awarding huge style points to this futuristic looking grill from Fuego. A former Chief Designer for Apple designed this LPG-burning grill. That helps explain why it looks so different from standard propane barbecues. With its cylindrical design, the Element looks like it might blast off into space at any moment. The cylinder cleverly hides the LPG tank and connection in the most space-friendly way possible. The whole thing, including the wheels, is no wider than the grill itself; the whole thing is just 21”x21”. So, you get a decent size grill (346 square inches) with a compact footprint. Thanks to the circular burners, and the design of the lid, this little ‘cue can get to 500F in just 5 minutes. Remarkably, you can establish two temperature zones, enabling you to sear and then finish on lower heat just like on the big boys. The heavy-duty grate (15 pounds of cast iron) maintains even heat, and will hold up to frequent usage. Since it’s on wheels, it should be easy to move around. This is ideal if you don’t have room to leave a barbecue in one spot all the time – just roll it out for grilling, then slide it back out of the way when you’re done. With the tank neatly stowed underneath, you’re not tethered to a natural gas line or electrical outlet, meaning you can grill wherever you have room. Helpful features include a residue tray for catching grease run-off and a thermometer built into the lid. The lid is not hinged, but it will sit neatly in or hang from either handle. It would have been nice to see a work surface attached, but I recognize that would detract from the design aesthetics plus add size. Honestly, this grill looks so great, it might be worth having, even if you don’t have a small outdoor living space. If oversized outdoor kitchens or smokers with trailer hookups aren’t your thing, a Fuego could be just the grill for a style-conscious, casual barbecuer. Though the infomercials may have been laughable (I think that’s the point of infomercials), I can tell you from personal experience that the George Foreman grill is actually a pretty good product! I’ve “grilled” all kinds of small cuts of meat, burgers, wieners, and sausages on this little device, and I’ve always been pleased with the results. Part of the trick is to manage your expectations – this isn’t a competition-grade smoker! But, when true grilling hasn’t been an option, I still prefer the Foreman to a frying pan. Really, this is just a GF grill on a stand. 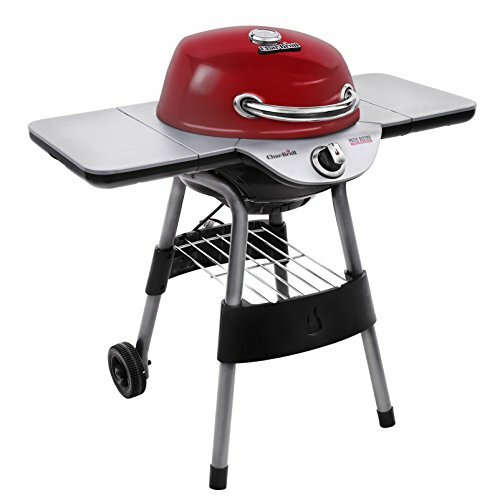 Conveniently, it readily detaches from the stand so you can grill indoors, too, or take it on the road. Because it is essentially a ridged frying pan, it comes with those benefits, too; it has a non-stick ceramic coating, it heats evenly, and you can take the cooking surface off to clean it. For such a low-profile piece of equipment, the grill surface is fairly large at 240 square inches. You have very precise control over how hot it gets, and the built-in thermometer lets you know if you’re at the right temperature. 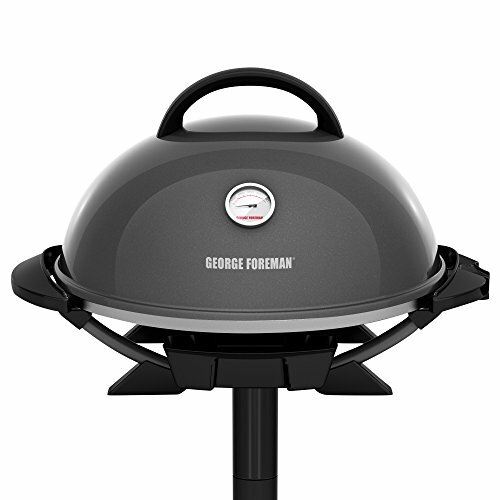 Of course, everyone knows the George Foreman Grill diverts grease and drippings away from the meat, and this model is no exception. The grease flows to holes in the center of the grate and down to a drip tray. You don’t get smoky flavoring from the drippings, but you’re not frying in your own grease, either. Is it really barbecuing? No, I won’t pretend that it is. Is it better than no barbecue at all? I think so – at least you can cook outdoors, and enjoy the weather and the social aspects of grilling. If you don’t absolutely have to have an electric grill, don’t get one. But the option is there if there’s no other choice. If your outdoor space has you limited to buying an electric, but you really are a griller at heart, we have you covered. Here’s an electric grill that looks like a “real” barbecue and provides surprising versatility. 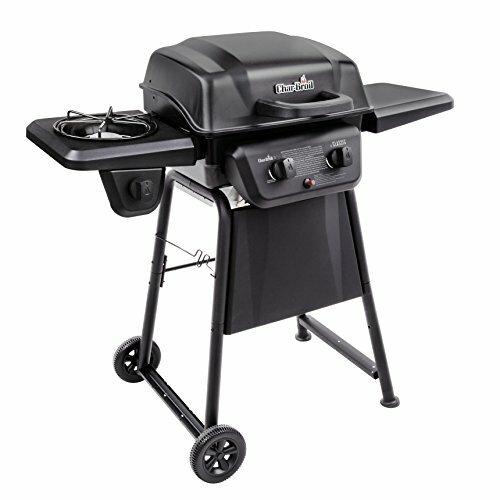 Char-Broil is a well-established manufacturer in the gas and charcoal grill business. You may not realize that they also produce two electric grills. This one is the top-of-the-line. There are some really nice features on this grill, including a hinged lid, thermometer, and a top rack for indirect cooking and warming. There’s a convenient wire rack integrated into the stand, plus work surfaces to either side of the cooking area. I’m happy to see both side shelves fold down when you don’t need them. The porcelain-coated, cast iron grate gives 240 square inches of cook surface, not counting the upper rack. Char-Broil guesses that’s enough room for up to a dozen burgers. Maybe small ones, but still, not bad for a compact grill. Oh, and if you don’t like the red one, you can go for black or graphite, instead. I’m trying to find something to not like about this grill, but I’m struggling. It has the look of a traditional ‘cue and seems like a pretty decent substitute. Geez, it even has a cord wrap at the back. This is a well thought out grill. It’s pricier than the George Foreman, but as long as you have no need to grill indoors, this seems to be the better choice in the electric category. Well, what do you say? Feeling a little better about your personal space now? As you can see, there is a grilling option for just about any situation, no matter how tight it is, or how hopeless it may seem. If none of these seem small enough, have a look at our articles on the best portable gas grills to see the most compact grills out there. Now that you have this information, we encourage you to think carefully, do a little comparison-shopping, and go out and get yourself a barbecue! They are a perfect accompaniment to a small-space, frugal lifestyle, and you shouldn’t be without one. Perhaps you have a friend or relative who’s in this boat? (Or maybe, they’re actually on a boat?) Do them a solid and hook them up with this article. We totally don’t mind if you share the link on social media, through an email, or whatever you’ve got. If you liked this article, or if there’s something you’d like to say about it (good or bad! ), drop us a line in the comments below and let us know. Your feedback makes us better! Thanks for reading – until next time, get out there and grab life by the grill!